Welcome to the newly branded Next Generation Defence Technologies podcast series. I’m Alison Caldwell and I work for Defence Science and Technology or DST. 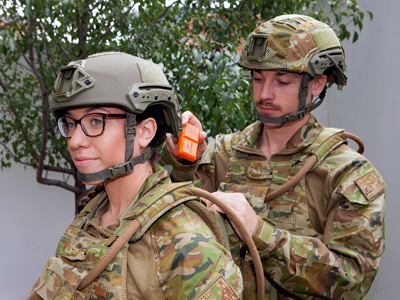 This podcast is about the work of DST’s amazing scientists and their partners who are working together on emerging technologies for Defence under the Next Generation Technologies Fund. The Next Gen Tech Fund is well into its second year, focusing on fundamental research and development of future game-changing concepts for Defence. This podcast is about the Fight Recorder, a project being developed by DST in conjunction with two small startups, Myriota in Adelaide and iMeasureU in New Zealand. It’s being led by DST scientist Nick Beagley, the Program Lead of Enhanced Human Performance. I caught up with him as well as with Alex Grant from Myriota and Mark Finch from iMeasureU, but first here’s Nick Beagley. Nick Beagley: Well DST is really quite famous for the invention of the Black Box Flight Recorder and the Fight Recorder is an evolution of that concept, technology has moved on that allows us to miniaturise aspects of the Flight Recorder and put those technologies on the soldier themselves and the Fight Recorder project that we’re developing under the Next Generation Technologies Fund is exploring that really early concept of can we miniaturise these technologies and apply it in such a way that we can practically put an emergency beacon on the soldier and gather the data in such a way that will allow to reconstruct any events that may happen to that war fighter. There’s real opportunities from emerging technologies that are being developed by commercial industry and there’s great innovations happening in the universities around the country and really what we do as DST is we look to see what those emerging technologies and knowledge are and we bring them together and combine them to address particular needs of our Defence capability and Fight Recorder’s a really good example where the miniaturisation of satellite communications and the analysis of data gives us an opportunity that we would never have had before. Alison Caldwell: How would it work in the field with a soldier? Alison Caldwell: And would that information be sent back to their base immediately? Nick Beagley: No the idea of this is that the information is stored for later analysis what it does provide us with though is the ability to connect to a satellite as an emergency beacon so that first period after an incident is critical to the survivability of the war fighter being able to precisely locate and send back key information as to the nature of the incident is vital to the response. We can’t possibly be the source of all of the bright ideas or all of the skills necessary to put those ideas together into a practical system that might eventually find its way onto the war fighter. We take the example of the Fight Recorder we’ve got two partners that we’ve selected to help us to explore that concept of the Fight Recorder we have a small firm in South Australia, Myriota, who are world leading experts in the field of low earth orbit satellite connection and the Internet of Things and they are ideal partners to develop the beacon element of the Fight Recorder. Alison Caldwell: How did you hear about the project? Alison Caldwell: And how did you find the application process what was it like? Alison Caldwell: When you say a relatively new start up, when did you start? Alison Caldwell: When you got the contract did you find you had enough staff or did you have to hire new people? Alex Grant: Myriota will be hiring new people over the next one to 2 years I think the Fight Recorder project is certainly helping with that I think the more significant effect the project has had has been supporting our case for private investment which is where the real jobs growth comes from so the fact that we are able to compete amongst our peers and globally for a project like this certainly raises our status and builds a case for private investment which we will certainly be expanding the company over the next couple of years. Nick Beagley: There’s another small firm called iMeasureU from New Zealand who are world leaders in understanding the date and turning that data into human performance measures and they are developing the software algorithms that would allow the event reconstruction that Fight Recorder is promising. Mark Finch: We’re developing the software that is a bunch of machine learning and artificial intelligence on the data to be able to characterise the activity that those war fighters were doing. We’ve set up a baseline of 7 activities whether it be walking, running, crawling, jumping, sitting, standing so will pull in all this data and build algorithms around to inform the people in charge can understand what activities the war fighters were doing in the lead up to an event. Alison Caldwell: And you’ll be able to get all of that information onto a tiny chip? Alison Caldwell: What does it mean to your company to have a contract like this with Australia’s Defence Department? Nick Beagley: The whole field of the Internet of Things and the military Internet of Things is really in its infancy whilst you are starting to see some early concepts being developed and prototyped the Fight Recorder is really at an earlier stage. Being able to put these systems on planes and trucks is one thing, being able to put this on a soldier is quite another there are many technology challenges that we will discover along the way and have to solve but we’re very hopeful that through the Fight Recorder project we will be able to get to a technology readiness level sufficient to then hand on to industry development to then produce something that may be possible to put on the soldier through either investment programs such as the Defence Innovation Hub. Alison Caldwell: Could Fight Recorder have civilian applications? Nick Beagley: Absolutely if you think about what Fight Recorder would do for the war fighter you can see many other scenarios within the civilian community such as fire fighters or even athletes or hill walkers where having an emergency beacon would be very valuable the ability to reconstruct events from a single sensor is a real research challenge if we’re able to solve some of that the applications of that are quite widespread and some of them we don’t even know yet. Alison Caldwell: That was Nick Beagley, the Program Lead of Enhanced Human Performance with DST. You also heard from Alex Grant from Myriota and Mark Finch from iMeasureU. I’m Alison Caldwell. We’ll have another Next Generation Defence Technology podcast for you to listen to soon, so keep checking on @DefenceScience on Twitter, LinkedIn, Google Play or Apple iTunes. Thanks for listening. Subscribe to the Next Generation Defence Technologies podcast on iTunes, Stitcher and TuneIn, using the links below.